Your Stupid Minds returns to its roots with a very special "wrestler" themed podcast as we review the 2000 buddy/road movie/wrestling commercial Ready to Rumble. David Arquette and Scott Caan play two... sanitation workers(?) that love wrestling, and when evil promoter Titus Sinclair (Joe Pantoliano) performs a classic "screwjob" to take the belt from their hero, Jimmy King (Oliver Platt), the two help to train King for his big re-match with the evil Diamond Dallas Page. As part of the marketing campaign for the movie, David Arquette, the actor, was made WCW Champion very briefly in 2000. He lost the title back in a "triple cage" match similar to the movie's finale. 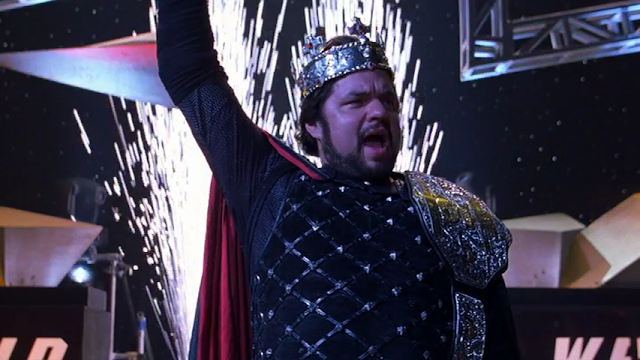 The story of Jimmy King being "screwed" by Titus Sinclair has several similarities to a real life issue between WCW promoter Eric Bischoff and aging star Ric Flair. Flair, a noted alcoholic, was fired for allegedly missing a show in the spring of 1998 and filed a lawsuit (in real life) against the company he had helped to build. By late 1998 he was back in WCW. Randy Savage and Perry Saturn (aka the bald home invasion wrestler) no longer worked for WCW by the time this movie was released. Additionally, DDP was a top babyface (good guy) when the movie came out. As of 2013, only Randy Savage (heart attack while driving) and Bam Bam Bigelow (drug overdose) have died. Diamond Dallas Page seems like a really cool guy in real life, as he developed a yoga/weight loss program and has offered free assistance to troubled wrestlers like Jake the Snake Roberts and Scott Hall. His YouTube channel is here. Ahmet Zappa plays a rude convenience store clerk and Dweezil Zappa produced and performed DDP's entrance music.